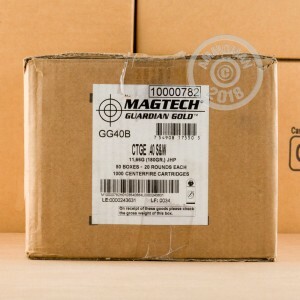 CBC, the manufacturer of Magtech ammo, designed Guardian Gold as a self-defense complement to its popular range ammunition. To ensure maximum quality control, CBC makes all of the components for this ammo and carries out rigorous inspections before shipping it out. 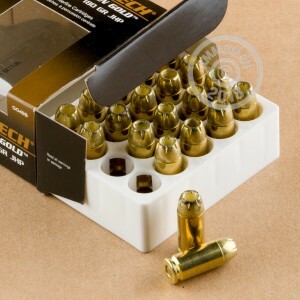 This ammunition is a great carry load for owners of M&Ps, XDs, and Glocks chambered in .40 S&W and fires a medium weight 180 grain jacketed hollow point bullet at a muzzle velocity of 990 feet per second. 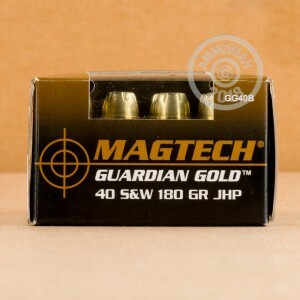 Like other Magtech cartridges, this ammunition uses non-corrosive Boxer primers and reloadable brass cases. Each box contains 20 rounds. Combine this box with other great deals at AmmoMan.com to qualify for free shipping. This promotion applies to all orders over $99.